"This is a very delicious rice dish! It's similar to an Indian-style rice pudding recipe. Enjoy! 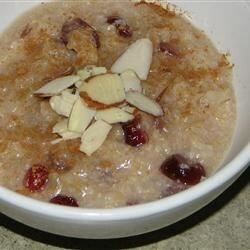 Top with slivered almonds and cinnamon if you'd like." Combine rice, raisins, milk, honey, and butter in a saucepan. Bring the mixture to a boil, reduce the heat, and let it simmer for 15 minutes; stirring occasionally. Stir in lemon rind and juice. Serve the rice in bowls and garnish (optional) with cinnamon and slivered almonds. See how to make steamed rice with fresh boy choy. I thought it tasted fine, but my family didn't like it. It turned out too sweet and tasted almost like eating a spoon of pure honey. This was probably meant for dessert, but I ate it for breakfast! yum yum. 1/3 cup of honey was plenty of sweetness for me, and I may reduce it even more next time. i omitted the lemon to make it more like what i remember from years ago - and it was PERFECT. creamy and sweet, it was a perfect way to use leftover rice for dessert. Wow! Really great recipe--it has already been added to my cook book. Thank you! Totally delicious. Added cardamon and cloves which gave it a little more flavor depth. Will make again!